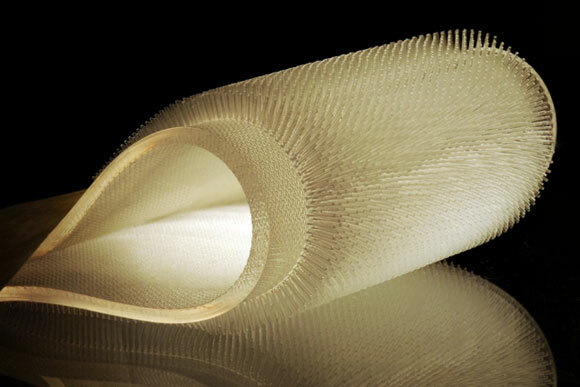 Inspired by semiaquatic mammals such as beavers and sea otters, MIT engineers are fabricating fur-like rubbery hair-lined wetsuits that may help keep surfers warm. Inspired by these fuzzy swimmers, MIT engineers have now fabricated fur-like, rubbery pelts and used them to identify a mechanism by which air is trapped between individual hairs when the pelts are plunged into liquid. The results, published in the journal Physical Review Fluids, provide a detailed mechanical understanding for how mammals such as beavers insulate themselves while diving underwater. The findings may also serve as a guide for designing bioinspired materials — most notably, warm, furry wetsuits. Hosoi’s co-authors include lead author and graduate student Alice Nasto, postdoc José Alvarado, and applied mathematics instructor Pierre-Thomas Brun, all from MIT, as well as former visiting researcher Marianne Regli, and Christophe Clanet, both of École Polytechnique, in France. The group’s research was motivated by a 2015 trip to Taiwan. Hosoi leads MIT’s [email protected] (Sports Technology and Education at MIT), a program that encourages students and faculty to pursue projects that help advance sports technologies. In the summer of 2015, Hosoi brought a group of [email protected] students to Taiwan, where they visited several sporting goods makers, including the wetsuit manufacturer, Sheico Group. To make hairy surfaces, Nasto first created several molds by laser-cutting thousands of tiny holes in small acrylic blocks. With each mold, she used a software program to alter the size and spacing of individual hairs. She then filled the molds with a soft casting rubber called PDMS (polydimethylsiloxane), and pulled the hairy surfaces out of the mold after they had been cured. In their experiments, the researchers mounted each hairy surface to a vertical, motorized stage, with the hairs facing outward. They then submerged the surfaces in silicone oil — a liquid that they chose to better observe any air pockets forming. From these experiments, it appeared that the spacing of individual hairs, and the speed at which they were plunged, played a large role in determining how much air a surface could trap. Hosoi and Nasto then developed a simple model to describe this air-trapping effect in precise, mathematical terms. To do this, they modeled the hair surfaces as a series of tubes, representing the spaces between individual hairs. They could then model the flow of liquid within each tube, and measure the pressure balance between the resulting liquid and air layers. Be the first to comment on "New Beaver-Inspired Wetsuits May Help Keep Surfers Warm"